So this week Dan and I are in Georgia. We really like it here. It is not as hot as Louisiana, and not quite so ghetto. 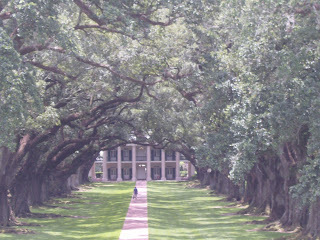 These pictures are of some of the old plantation homes that we have seen while we've been in the south. The pictures don't do them justice. They are really pretty and big for being so old! In Atlanta, we went on a tour of the CNN studio. We saw the newroom and watched them record the live news. We also walked around the Olympic park. Our favorite thing was visiting Stone mountain. It is just this huge stone mountain in the middle of this flat, green landscape. 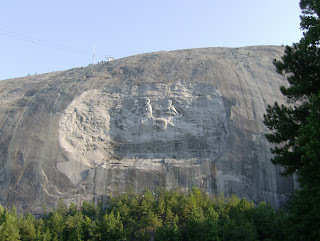 There are some civil war generals carved into the side of the mountain. Supposedly the same people who carved Mount Rushmore did this too. We didn't hike to the top because we were too lazy! When it got dark there was a really cool laser show and fireworks display. We also went to my really good friend Lissy Murphy's homecoming talk in Atlanta last Sunday. It was really fun to see her again. Dan even got to play some frisbee with her brother, so he was happy! We are headed to Philadelphia on Saturday. We'll be there for the rest of the summer until we head back to good old Provo! 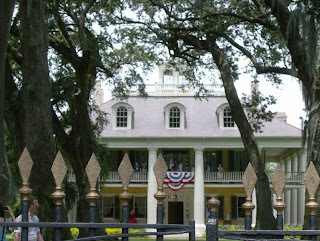 Love those old plantation houses. If you could take it and transplant it to Montana, it would be my dream house! Have fun and see all the sights! Oh, are the Georgia peaches really that much better? You'll have to do some research and find out! Those houses are huge and beautiful! I love the pictures, I do wish that I could see them in person, though. I can't beleive that Lissy is home already...geez time flies! I am so glad that Dan got some frisbee in...gotta have frisbee! hehe! What kind of trees are those in the picture--they make a perfect arch. So glad you are taking pictures and sharing them with us. Did you get to have a tour of those homes? Hope you're doing fine. Glad you're having fun in Georgia. the houses are cool.